Baby-fine hair may be one of the biggest beauty challenges today, but Stan Vasilewho prefers the title, “Master of fluffy, fancy, fine hair” claims a magic touch that can transform ho-hum hair. There are, undoubtedly, many out there who would rejoice to know that their hair doesn’t have to be kaput all daylong. If you are such a person, Vasile can give your hair the vitality and pizzazz you want. 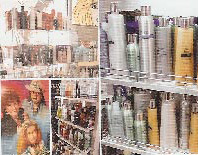 Vasile’s “gift from God” is,he says, at the root of his business’ success.The combination of his technique, his products, and his European touch transforms baby-fine hair at its worst into a glamorous, sophisticated hairstyle. Vasile cites the Graham Webb brand as the perfect products for babyfine hair. You won’t find Graham Webb just anywhere, thoughthe company only sells to the top hair salons. Even such a common ailment as stress can cause hair to lose some of its softness, movement and lift, according to Vasile. At his salon, massage is incorporated into the hairstyling process to reduce stress. If you come to see the master of baby-fine hair at work, you may notice him using a copper contraption to massage the guest’s head. The device looks like a large copper wire spider and causes a relaxing, cool, tingly sensation all over the head.According to Vasile, it will take away migraines, reduce stress and leave the person feeling much more relaxed. The Vasiles’ daughter Maria, a student at the Virginia Military Institute, discovered this stress-reliever. She noticed that her roommate was never tired even though they both had rigorous schedules and,after trying it herself, Maria was fresh for military school the following day. “Three weeks later, she called me and she said, ‘My hair looks so healthy and has so much body with this copper spider massage,’ ” notes Vasile. Aside from decreasing the stress that can negatively impact a hairstyle, several other elements are vital for healthy, beautiful hair, one of which is color. Since highlights create the new look that people are going for, Vasile will match hair color with the person’s skin color and eye color. Vasile has brought European finesse and charm to Tucson in a unique way. He testifies that people from large cities like L.A.and Chicago come in to have their hair done and ask him how he is able to stay in business in a place like Tucson. But Tucson is growing, and newcomers are often delighted to run across Vasile’s European influence especially as many of them were used to going to this type of hair salon in the larger cities where they are from. “People who come from big cities,they had a lot of European hairdressers therethe top percentage go to the big cities.” As the third generation of hair stylists in his family, Vasile maintains a tradition of not only sophisticated haircuts but also making the process fun. He is known to dance and flip his tools at the European hair shows where he judges and performs. His grandfather was a great inspiration to him and, amazingly, was still styling hair at the age of 95. His grandfather’s old barber chair a piece of Vasile’s childhood experiencecan still be seen in the salon. “I keep that in our family,” he says. Given the enthusiasm that perhaps runs in his blood and a role model like his grandfather, it wouldn’t be surprising to find Vasile himself still styling hair at age 95... and loving every moment of it.